Hi crafty friends! Stopping by for a quick post. Two posts in one day, that's a first! And I have a special reason for that. Papertrey is celebrating its 6th year anniversary this month. And as part of the festivities, they have daily challenges which give you a chance to win some fabulous prizes. I never won anything before so this might be my turn, ha! So today's challenge is to create a project that uses one of the images included on the free printables provided. Head over to Nicole's blog to see the cute images. I chose Erin Lincoln's flamingo image. And here is my card. Isn't she the cutest? So sassy with her necklace and all. I used Papertrey's white cardstock, quatrefoil die, double ended banner die, the new mat stack 6 die and sentiments from Mega Mixed Messages. The red and teal cardstocks are from Michaels. Here's a close up of the quatrefoil die. I forgot how much I love this die and I am so glad to be able to use it again for this project. Thanks for stopping by and hope you are having a lovely evening! Oooh, that printable is perfect on those mat stack 6 dies, Irma! Great card! Cute!! Lovin' that embossed background!! 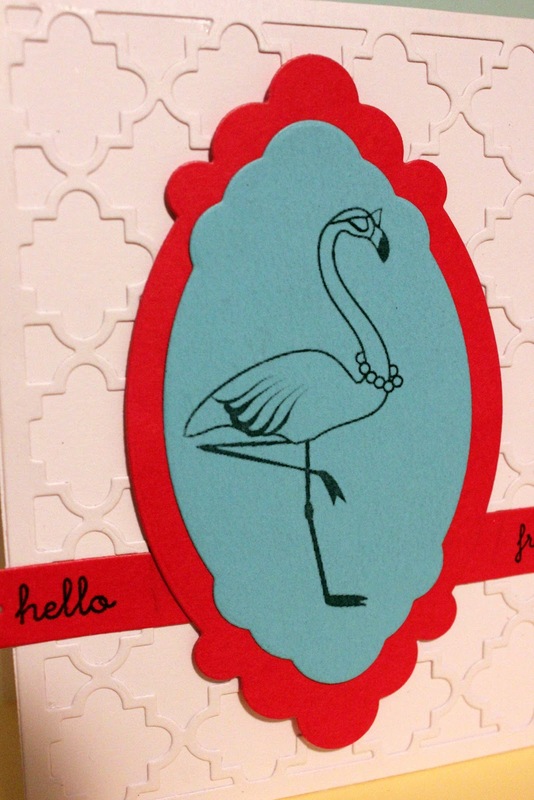 I love the tone on tone you used with the coverplate, and how that cute flamingo fit in that frame! Gorgeous! 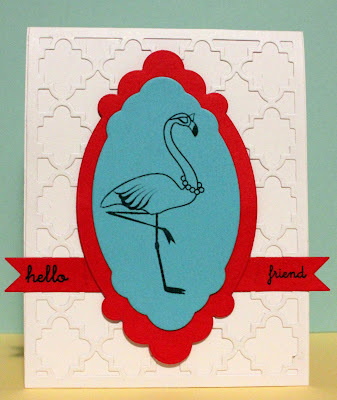 Love that flamingo in turquoise!